Tweet This Friday barring any complaints from the wife and catastrophes at my day job I’m going to check Mike Portnoy, Billy Sheehan and Richie Kotzen, also known as The Winery Dogs at Durty Nellies in Palantine, IL. Their self titled debut album came out earlier this year. I was given a free copy, but I liked it so much that the day it came out I went out and bought another copy. With The Winery Dogs you’ve got Mike Portnoy who is at least in the discussion for best rock/metal drummer of all time and Billy Sheehan who is in that same discussion amongst bassists. Then you have Richie Kotzen who is insanely underrated. He so underrated that he’s in a band with Mike Portnoy and Billy Sheehan and his star shines the brightest. There’s just something I love about accomplished musicians playing together. The Winery Dog’s is simply a rock band, but they’re not afraid to play. This isn’t prog rock; this is classic rock that isn't old. The songs came first with these guys and the musicianship came second. I assure you all of their musical egos were satisfied. It’s a jam band with guys that can not only play their instruments, but are arguably the best at it. It all starts with that first track "Elevate." The opening riff of this album lets you know what you’re in for. I’d say if that riff doesn’t grab you then at least make it past the bridge and tell me this isn’t amazing. Kotzen channels Chris Cornell and Paul Rodgers with a taste of his own flavor and he’s an amazing guitarist. It’s going to take a lot to keep me from this show on Friday. The Winery Dogs are on tour now. 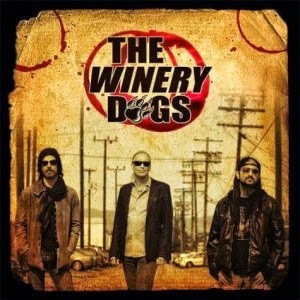 Check out www.thewinerydogs.com for tour dates in your area. If for whatever reason you’re not digging The Winery Dogs stop by a live show in your area and see if they can change your mind. Have you ever gone to a concert and ended up liking an album better after hearing it live? I have and this is the type of band that seems like they turn it up to 11 live.